You and your partner have tried everything to fix the relationship, but despite your attempts, you now accept that divorce may be imminent. It is no question that these times can be some of the most stressful and emotional times for married or de facto couples alike. It is the start of a new chapter in your life and with it, comes big change which can make people anxious and overwhelmed. It is important that during these times, you and your partner treat each other with respect and conduct yourselves in a manner which provides for a meaningful resolution of your marriage and affairs. It is so become overly emotional which can cause you to lose track of what really matters. In Australia, if a married couple wants to formally separate they will need to apply to the Court for a divorce. However, there is no formal process for de facto couples. Divorce is a generally a fairly straightforward process dealt with by the Federal Circuit Court of Australia. However, questions such as the validity of a marriage can throw a spanner in the works. There is no reasonable likelihood of getting back together. Applications can be made jointly, or by yourself as an applicant, and your spouse will be the respondent. Regard Australia as your home and intend to live indefinitely in Australia – lawfully present in Australia and intend to continue living in Australia. Are an Australian citizen by birth or descent – born in Australia or outside Australia and at least one parent was an Australian citizen, your birth was registered in Australia. Are an Australian citizen by grant of an Australian Citizenship. Live in Australia and have done so for 12 months immediately before filing for divorce – have lived continually in Australia for a period of 12 months immediately prior to filing for divorce, not including overseas holidays or business trips. 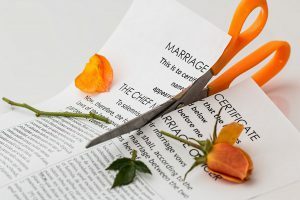 In 2015, the Australian Bureau of Statistics has reported that there were 48,517 divorces granted in Australia, which is an increase of 4.3% from the previous year. The median age of males and females at divorce was 45.3 and 42.7 years respectively in 2015. The median duration of the length of a marriage to divorce in 2015, was 12.1 years, a slight increase from 12.0 years reported in 2014. If you would like further information on the divorce process, we recommend you first read the numerous resources contained on the Family Courts Website. If you would more information on the actual divorce application, please click here. If you are ready to take the next step and would like a confidential discussion with one of our expert Divorce and Family Lawyers in Sydney CBD regarding your application for Divorce, call Rockliff Snelgrove Lawyers today.